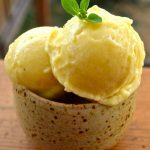 Rich, smooth, creamy ice cream that is healthy enough to eat for breakfast! Peel and cut the mangos into cubes. Put the mango and the banana pieces on a small baking sheet lined with a silpat or baking parchment). Freeze (I always do this at least the day before I make my ice cream but you could probably get away with a few hours before). Once they have been in the freezer and gone solid you can either use them right way or transfer them to a freezer bag or container of some kind if you are leaving them longer. This will ensure they don't get freezer burn. Bear in mind that if you skip this step and just put the fresh pieces of fruit in a container together then freeze them, they will stick together and be difficult to prise apart making it a struggle to fit them in the bowl of your food processor/blender. When you are ready to make your ice cream place your frozen fruit into the bowl of a food processor or powerful blender (if it is stuck in the container just run a little warm water over the outside of the container. This will loosen it enough for you to get it out). Add your non-dairy milk and blend/process until smooth. I use a Cuisinart food processor and mine took 3 - 4 minutes. It will look like it's never going to go ice-creamy but stick with it. You might need to stop it throughout to push it down the sides and stir it around a bit. After a few minutes you will have a smooth, creamy ice cream. Give it a little taste to check the sweetness. Often there is no need to add any sweetener but it depends on the sweetness of the mangos so feel free to add a few drops of liquid Stevia, maple syrup or other liquid sweetener of choice to suit your tastes. Just process for a minute after you add it.